Note: If you prefer to read instead of listen, click the transcript graphic bar below for the printed version. Atrial Fibrillation is often accompanied by Fear, Anxiety and Stress. That’s the topic of this podcast between Steve and our friend, Travis Van Slooten, publisher of LivingWithAtrialFibrillation.com. We discuss many ways that may help you with the emotional component of A-Fib. This is a longer episode (37 min.) as Travis and I had a lot to share and discuss! Note: Resources mentioned in this Podcast, plus others, are included below as hyperlinked text. 1.Knowledge is power. Knowledge is control. 3. Give yourself a daily “worry period” and then move on. 5. Consider yoga, meditation, and other relaxation techniques. 6. Engage in light-to-moderate exercise such as daily walks. 7. Natural remedies to try: lavender oil, pharma GABA, L Theanine, magnesium, Relora, chamomile, and Gotu Kola (Centella asiatica). 8. Prescription drugs such as Xanax and Ativan may help. 9. Professional counseling – especially Cognitive Behavioral Therapy (CBT) can help. 10. Reach out to A-Fib.com’s Support Volunteers. 11. Contact A-Fib.com’s Positive Thought/Prayer group. 13. Don’t become socially isolated because of your A-Fib. Stay connected with others! 14. Spiritual beliefs can help combat fear and anxiety. Pray. Go to your place of worship. Meditate. Travis Van Slooten: All right, for today’s episode of The A-Fib Podcast I invited Dr. Steve Ryan back again. Steve is a former A-Fib patient who was cured of his A-Fib back in April 1998 via a catheter ablation. 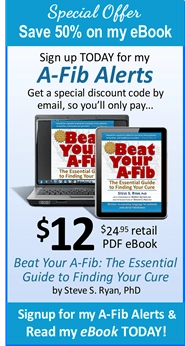 He’s the publisher of one of the most popular A-Fib websites, a-fib.com, and he’s the author of the bestselling book, Beat Your A-Fib: The Essential Guide to Finding Your Cure. In this episode, Steve and I discover various things afibbers can try to do to help combat the mental and emotional challenges that come with having atrial fibrillation. So with that, let’s have a listen. All right, Steve, what I want to talk about today is the mental and emotional challenges that afibbers face, because as you know A-Fib is a lot more than just the physical aspects of the condition. In fact, often times it’s the mental and emotional challenges that are harder to overcome than the physical aspects of A-Fib. Travis Van Slooten: And I’m talking about those things like anxiety, fear, worry, confusion, frustration, depression, and of course, even anger. But as you noted, Steve, on your website so eloquently, A-Fib may be in your heart but it doesn’t need to be in your head. So with that Steve, I want you and I to give afibbers a variety of things that they could consider doing to combat some of these mental or emotional challenges. So with that, Steve, what are some of the things then that afibbers can do to overcome these things? Steve Ryan: First, Travis, let me thank you for bringing up this subject; it’s perhaps one of the most important subjects that patients have to deal with. Let me start off by giving you a personal example. 20 years ago I had my first afib attack, and I can remember it like it was yesterday. I came home from work – I was working on the soap opera Days of Our Lives as part of the technical crew; best job I ever had besides what I’m doing now – and my wife wasn’t home. She was out of town. I walked in the door — five minutes later my heart started going crazy on me. It felt like my heart was trying to jump out of my chest. I had all this pounding and confusion and naturally you’re asking yourself: what’s going on? Am I dying? Am I having a heart attack? You know? You’re terrorized by this thing. Because what was, you know, I wasn’t thinking straight and just drove to the hospital, the ER, and by the time I got there the episode was over. But anyway, one of the hardest things to deal with is the terror and confusion and anxiety, like all the things you mentioned; I went through all of them in one night. And especially anger; for me anger was the key. I was so angry. I’m in perfect shape. I’m running. I’m doing everything I should, and I didn’t talk to my heart but I mean, you know? I say why are you doing this to me? I’m taking good care of you, why are you behaving like this? Travis Van Slooten: Yeah, I’ve been there. Steve Ryan: So, unfortunately, when you have something like this and you go to the typical ER doctor you don’t expect much help. They’ve been trained to deal with the physical aspect of A-Fib, not the emotional and psychological. They don’t have that kind of training; they don’t have that kind of interest. So unfortunately we’re left to ourselves, and I wish I had a guaranteed way to help everybody but we’re doing the best we can. The first thing is knowledge is power, knowledge is control, and the more you learn about A-Fib…Let’s say for instance in my example; if someone had told me “Well, you’re not going to die from an A-Fib attack, that’s not what happened; it feels terrible but it isn’t going to kill you.” Well, if I had known I would have been much more relieved because I didn’t know that at the time. And just to know that A-Fib is a heart condition, that as bad as it feels it’s not going to kill you immediately, that’s very stress relieving. And the more you read, the more you can get involved in websites — and good websites, not these fly-by-night things: Mayo Clinic, Cleveland Clinic, our sites, my book. Anything you can do to develop more knowledge about A-Fib will give you more control, will give you a sense that, hey, I don’t have to live with this disease, it’s not going to kill me. I know what to do now. I know what causes it, any kind of knowledge that you can get to help relieve this anxiety. Also, I’d like to mention that on our site we have over a hundred stories of people who have had A-Fib and been cured. Not all of them have been cured. But read some of those. If you find out that other people have symptoms like you and have been cured, that’s a real relief, that helps anxiety and gets you over the hump, so to say. Travis Van Slooten: Oh absolutely. I just want to backup a second. I’m just curious, Steve, so when you were first diagnosed what did your doctor tell you about A-Fib, or did they not say anything? Steve Ryan: Again, it’s been 20 years so I can’t tell you exactly, but what I remember is they just gave me drugs. I tried every conceivable medication known to man at that time and they all didn’t work, and that’s all they could do. I don’t remember exactly what they said but they considered it a serious disease. They didn’t blow me off and say, “Don’t worry about it. There’s nothing to worry about. Everybody gets things like that.” No, they didn’t do that, they considered it seriously and they were trying to do what they can to get me out of it, but 20 years ago they didn’t know very much about A-Fib. Travis Van Slooten: Yeah, so I was like, “Okay, this can’t be a big deal,” but I, being the kind of person I am, type A person, I made the appointment the next day. And fortunately my cardiologist was an elderly cardiologist, and I didn’t know it at the time but he was nearing retirement. So he was in his upper 70s and he just was like, “Yeah, you have atrial fibrillation. It’s not a big deal. I’m going to put you on a Holter monitor. We just want to make sure that your heart is fine,” and so they sent me on my way for a 24-hour Holter monitor. When I turned it back in he said everything looked fine. He said it’s no big deal. He said if these come back again—he said we have three options: we can cardiovert you again like you just went through, we can try some drugs as a lot of times that works, and if it doesn’t they have this thing called an ablation where we just go in and burn the spots, and you know, it’s not a big deal. And so I was very fortunate because I had both the ER doc and the cardiologist telling me that it wasn’t really a big deal so I went for the first several years of my atrial fibrillation thinking it wasn’t a big deal. So it was, for me, I didn’t even really need to get knowledge because my doctors were telling me “Ah, it’s not a big deal.” I don’t know if that’s necessarily the right approach either. 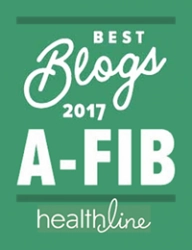 I think they’re somewhere in between, but for me, I didn’t really have too much anxiety or anything in the first few years of my A-Fib journey just because of the way they handled it. So I just find it interesting how different experiences we had. Steve Ryan: Well, you know, again, I think they erred on the side of being too cavalier. Travis Van Slooten: Yeah, exactly. Steve Ryan: Let’s face it, you don’t want your heart to be in a disease condition if you can avoid it. Steve Ryan: And also let face it, one of the things I faced was I never knew when I was going to have another attack; they would come and go. For instance, I know some people keep a log and try to determine what they eat. I tried at that, it was no use at all. I have attacks—whenever A-Fib felt like coming it came. I had no control over it. And that kind of thing really put you on edge, you know, you just can’t relax, you never know when you’re going to have an attack. That breathes anxiety and fear, and that’s something that we need to help patients cope with as much as we can. One thing that someone suggested to me that I thought seemed to work very well—I didn’t use it, but what he called it was an Anxiety Thought Log. This is from Anthony Bladen. And what he basically did was he recognized that in his subconscious all kinds of crazy things were going on. He was in fear, his subconscious was saying, without being explicit, “you’re going to die, you’re going to have another heart attack, you’re going to have a stroke, you are never going to get over this.” All these are things that are going around in his subconscious. What he did was he tried to write each of these bad thoughts down specifically, make them specific and he called it an anxiety thought log; write down word for word what the anxious log was when and what was the trigger. Confront each fearful thought and try to restate it in a more reasonable frame of mind. Another thing that people suggest is have a worry period, say, 20 Minutes a day; I’m just going to let all my thoughts go crazy, I’m going to worry about everything that I probably never should worry about and I’m going to let all these thoughts go and I’m going to do this for 20 minutes and then I’m going to go watch a movie or cooking show, whatever it takes to get into a different frame of mind and not try to worry about this any other time. These anxiety thought logs can be very helpful. And that’s one of the things we recommend for coping with the psychological and emotional effects of A-Fib. Travis Van Slooten: Absolutely. And I’ll just piggyback on that too, I think just dairying in general— you did mentioned in an episode diary. I tried doing that as well, it didn’t really work for me, but I know some people have emailed me saying for them it’s— for some people actually kind of tracking when they have the episodes it gives them kind of a sense of control. So that might not necessarily work for all people, like you said for some it actually might create anxiety, but for some people it might give them some sense of control so that’s another type of diary that you could do as well. Steve Ryan: Yes. Another thing that seems to help a lot is yoga relaxation technique, meditation. There is a real interesting study done by this doctor Lakkireddy at the University of Kansas. He had a bunch of his patients on monitors, and some of them were going to the same yoga class all together at the same time. And he noticed that, hey, these people, their A-Fib stops during this period of time, all of them. And he said, what’s going on here? So he found out that they were going to a yoga class, and all of a sudden the light bulb went on and he said, “Maybe I better check this out,” and he started doing testing. And basically what he did was he took these people – again, it’s a short study so it wasn’t really comprehensive – he took them and the for three months he assessed their frequency of their A-Fib episode, how long they were, their anxiety, depression, their quality of life. Then months later he switched them to take in yoga classes for three. Specifically, this was iyengar yoga, which I don’t know about, but that’s what he particularly used. Steve Ryan: Oh yeah. Now, walking is very good. Walking at the same time of the day 20 minutes with the fresh air, and that is very relaxing and can be a great help to just relieving overall anxiety and depression, and improving blood pressure. Again, whenever you do anything like yoga, like we always recommend, always check with your doctor first before you do anything like this. It may seem that’s not going to cause any problem but you should always talk to your doctor about this to make sure everything is kosher. Travis Van Slooten: Well, especially if you’re in persistent A-Fib and you’re already having issues breathing or whatever because you’re in A-Fib — absolutely. Awesome. Other things you mentioned on your website Steve were natural remedies, lavender oil, aromatherapy. I never did that. Steve Ryan: Travis, I forgot one thing. Can I go back? Travis Van Slooten: Oh yeah, absolutely. Steve Ryan: I forgot to mention a meditation technique called mindfulness. This is advocated by Harvard Pilgrim nurse case manager Linda Bixby. And what it is — now this may sound counter-intuitive, but what it is, instead of rebelling and being frightened by an A-Fib attack is to sort of embrace it, look at it; what am I going through? How does this feel? Okay, I see, my heart is beating a little faster, I’m getting a little dizzy, whatever it takes. It’s to observe rather than resist and worry. Let an A-Fib attack run its course. And like this one guy says; “What I do is just take it in and letting myself feel the physical A-Fib experience was actually relaxing.” Now, again, I’m not saying this will work for everyone but it’s a meditation technique that might help you. Okay, now let’s go back to what you mentioned about the natural remedies. Travis Van Slooten: Yeah, you had mentioned on your site natural remedies like lavender oil, aromatherapy – again, I never got into that – Pharma GABA. I also want to add L Theanine. I like Suntheanine specifically. I found Pharma GABA and Suntheanine to help a little bit to kind of take the edge off anxiety. Also just throw some other ones here magnesium, Relora , I’ve never heard of that actually. Chamomile and other herbal teas, and you have this other thing called Gotu Kola. I’m not even sure what that is, but talk to me about some of the natural remedies. Steve Ryan: Yeah, I can’t speak from experience on this because I’ve been cured of A-Fib for 20 years but I know I’ve tried lavender oil and it’s very soothing. It seems to smell really good and be relaxing. As far as the other one, Pharma GABA works on the same pathway as chemical things like Xanax and Valium but it doesn’t have all the negative side effects and it’s not addictive. It’s a bioidentical form of GABA which is gamma-aminobutyric acid. It’s a calming agent. It sort of calms your nerves. Steve Ryan: It’s worth a try. Travis Van Slooten: Yeah, absolutely. Steve Ryan: I mentioned Xanax; I should preface this by saying Xanax does have anti-arrhythmic properties but it’s addictive so you’ve got to be careful of it. There have been testimonials from people who take Xanax on a regular basis. I can’t recommend that again because it is addictive. Pharma GABA might be a better alternative for that. The others I mentioned Relora I have never tried it, I really have no idea. It’s supposed to reduce cortisol levels and promote feelings of relaxation. Chamomile tea, that’s been well known to reduce irritability and headaches and abdominal pain coming from anxiety. What you do is you substitute chamomile tea for caffeinated beverage or take 60 drops of chamomile tincture in two ounces of water four times a day before and after meals or add two drops of concentrated chamomile essential oil to a hot bath at night. Again, those are things that you can do that aren’t going to cause you any medical problems most likely, again, everybody is different. And in terms of Gotu Kola, I really have not had any experience with that. It’s supposed to restore health to brain and nerve cells by promoting blood circulation to the brain which has a calming effect. And as you know, A-Fib reduces blood circulation to the brain, so anything that improves blood circulation to the brain should be a help. Travis Van Slooten: Yeah, absolutely. And I’ll just say too with the magnesium, you could take that as an oral supplement or a spray. But another thing that I actually use even today – and I’m not suffering from A-Fib, knock on wood, thanks to my ablation – but I will do foot soaks with magnesium in the water, and I find that actually very relaxing. Steve Ryan: Epsom salt baths. Travis Van Slooten: Absolutely, very relaxing. Steve Ryan: The one thing you need to be careful of is don’t go whole hog on magnesium right away because excess magnesium if your body isn’t ready for it can produce diarrhea which defeats the purpose of the magnesium. Steve Ryan: So take it easy. If you use magnesium, start it gradually and work up to ideally 600 or 800 mg of magnesium a day. Travis Van Slooten: Yeah absolutely. I want to segue here and get into the meds just a little bit because you’d mentioned it. Again, I’m not a big advocate of meds but there’s no doubt there is a time and place for them. You mentioned Xanax. One of the meds that I was prescribed and that I even take today from time to time is Ativan, but these are drugs as you’ve mentioned can be highly addictive so you’ve got to be really careful about them. And typically when doctors prescribe these they’re very careful about how they prescribe it and they’re very careful to monitor how much you’re taking. But these are drugs at that, you know, like I said, I’m not a big fan of them but a lot of people — I know I get emails from a lot of people that say Xanax and Ativan helps them a great deal particularly during an episode. It just helps calm them and relax them. So I don’t want to discount meds. Again, it’s not something I recommend, but it is something certainly worth considering because they might in fact play a role for some people. Steve Ryan: Again, this goes along with counseling. If A-Fib is really bothering you, especially if you’re a guy, don’t hesitate to get professional counseling and they will indicate to you maybe if you need meds to take or that kind of thing. But guys especially we tend to tough it out “I don’t have to put up with this.” Get professional counseling if it helps, just someone to talk to about what you’re going through with A-Fib and your anxieties and what you’re worried about and how it’s affecting your family and how to cope with it. That can be important, so don’t hesitate to get professional counseling. It can be very helpful. Travis Van Slooten: Huge. And one of my readers had emailed me the other day actually. I had posted a question on Facebook and just asked hey, what do you guys do to combat anxiety? One woman contacted me and said she had tremendous success with Cognitive Behavioral Therapy or CBT. And so I kind of looked into that a little bit, and it turns out that CBT (Cognitive Behavioral Therapy) is one of the most effective natural ways to combat anxiety. So that’s definitely counseling and specifically cognitive behavioral therapy; these are things that definitely you want to have on your list. Steve Ryan: Yes, yes indeed, good. Travis Van Slooten: And you mentioned professional counseling, and on your site Steve you also have A-Fib support volunteers. Now, these aren’t professional counselors. Tell me a little bit about this program. Steve Ryan: Well, professional counseling is one thing, but these people are sort of like friends who have had A-Fib. They’re not professional counselors, they’re just friends you can talk to and share experiences with. And we have about 60 or 70 people on our website from all around the world who volunteer their time to talk to people and to be – how shall I say it – A-Fib friends; someone they can talk to about what they’re going through because they’ve been through the same experience. 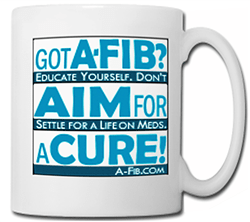 Not all of them have been cured; some are still in A-Fib. So you’re getting a wide spectrum of different people with different experiences. But that is very helpful. And we also have something that I don’t—well, let me talk about it and you’ll see what I mean. We have a positive thought prayer group, an A-Fib positive thought prayer group. Now what that means, if people are so inclined, what I do for instance when I go to church on Sunday I will have the names of people who are coming up for an ablation and I will ask people at church to pray for them, and if someone, let’s say, is coming up for an ablation and they join the positive thought prayer group they will get emails and prayers and positive thoughts from people all around the world. It’s very… well, I’ve experienced it myself. I recently had a colon surgery and I said to myself “Oh, gee wiz, why don’t I use this positive thought prayer group. You know, it’s not a fib but they can certainly be of help to me.” So I sent my information into them, and I was moved to tears by all the wonderful responses I got from people. Obviously, since I started the program I’m probably going to get more responses than the average person, but nevertheless, it was really heartwarming. I mean it brings tears to my eyes right now thinking about all the wonderful people who emailed me and who prayed for me and who thought positive thoughts about me when I had my surgery. It’s really wonderful. Travis Van Slooten: Yeah, and I’ll just attest to that because I’m actually on that list and so I get the emails that come through periodically. And you’re right though, I mean it’s very powerful. And you mentioned you might get more responses than someone else but I’ll just say that someone else actually they’ll get a lot of responses. It’s a very positive program, and I highly, highly recommend it. Now if they want to do the A-Fib support volunteer or this positive thought prayer group, they just go to your website, Steve? I assume there’s a link to these two different things. Steve Ryan: Yes, they have a link there that they can sign up for. Right now we don’t have a coordinator for the support volunteers, but we do have a great coordinator for the positive thought prayer group. But they still are functioning very well and people can make use of those resources. Travis Van Slooten: Absolutely. And the beauty of those types of resources—because the other thing I wanted to mention on our list here Steve, was list support from friends and family. Travis Van Slooten: Well, that’s definitely important, but one of the things that I hear from a lot of people, and I’m one of them, friends and family, you know, they can only take you so far because if they can’t empathize what you’re going through. A-Fib is such a unique condition that so many people just have a real hard time kind of understanding. So sometimes even though you reach out to friends and family you can still feel so isolated because they don’t really know what to tell you or how to support you. And that’s the beauty of your support volunteer group and the positive thought prayer group; these are people that have been there, they know exactly what you’re going through. Steve Ryan: It’s not like you’re bleeding or you have a broken leg; it’s hard for your family to identify with what you’re going through. You need to realize that A-Fib is going to affect you not only emotionally and mentally but socially as well. Maybe not necessarily your immediate family, but your friends, your co-workers; you need to sit down and talk to them and explain what atrial fibrillation is like and ask for understanding and try to communicate to them what you’re going through, because people go to work and all of a sudden they can’t do anything anymore because their brain is in a fog because if their A-Fib. It’s really scary when you have A-Fib, and you need to help your friends and support people understand what you’re going through. That’s very important. Travis Van Slooten: Yeah, and it can be very easy to get into this rut where you get into a situation where you start to isolate yourself from your friends and family, particularly if you have persistent A-Fib where you’re constantly feeling like crap, you know, you got friends inviting you out to do things and go golfing with you or whatever and you can’t because you’re in A-Fib. You get in the situation where you’re “No, I can’t go.” And like you said, it’s not a good idea to keep things to yourself; communicate with your friends and family, let them know, “Hey, this is what’s going on. I’m not trying to be antisocial but I just kind of feel like crap right now.” Because if they understand more it’s just going to help you in these situations. Travis Van Slooten: Let’s see here; you mentioned again the positive thought prayer group, and with that, you know, just religion and prayer can help a lot of people. I’m a Christian, I go to church regularly, I read the Bible daily. I try to make a point to listen to inspiring sermons on a daily basis, and I make it a point to meditate on God’s words every day if I can. So I don’t want to discount—I know some people may not be religious, but for a lot of us religion and prayer can go a long way in relieving anxiety and fear. Steve Ryan: Yeah, most of the people on the positive thought prayer a-fib websites are Christians but not all; many are of other religions, many have no religion. There have been studies that show that positive thoughts by itself can help other people, can help them improve their health. There have been studies on that. It’s not just a ‘we’re just making it up’ kind of thing; it’s really does have an effect on people. Travis Van Slooten: Absolutely. And then the final thing, Steve, I think that can help relieve anxiety and fear and all these negative emotions and mental challenges is – and it’s going to sound kind of weird – but medical devices accessories can go a long way. And I’ll just give you some examples from my end, and Steve you may have some as well from your readers and followers of your website, but one of my readers sent me an email; she wears a medical ID bracelet that she pushes a button and it calls 911 and she says that just helps her – she’s an elderly lady with A-Fib – and she says that just gives her a sense of security and control that if something happens she can click on this thing and help will be on its way. Others have had implantable heart monitors; and just knowing that your heart’s being monitored and so if anything weird goes on beyond A-Fib the doctor is going to be on the other line monitoring what’s going on with your heart. And of course, I’m a huge fan of Alivecor’s Kardia heart monitor. That thing, I cannot tell you Steve how much that got me through my A-Fib episodes; just having that device there to kind of walk me through what was going on because as I was going through an episode I could grab my Kardia heart monitor and confirm I was in A-Fib—because I was on pill in the pocket therapy at that time so I would pop my flecainide, but before I would do that I wanted to make sure I was actually in A-Fib so I used this monitor, the Kardia monitor, and then after the flecainide kicked in and I cardioverted I would use the monitor again just to confirm that I was out of A-Fib so that device was a savior for me. So these medical devices can go a long way in giving you a sense of control over this condition. Steve Ryan: Yes, and now they are developing a watch that you wear, and you just hit two buttons on that watch and it tells everything that’s going on. It’s perhaps one of the best things that has happened to patient care in maybe the last 10 years. Why? Almost everyone over 65 should have some kind of testing for atrial fibrillation, and instead of going through EKG and maybe there is nothing going on and having a 30-day monitor or something like that, you just put on this watch and it tells you all that information, and it tells the doctor everything. From a public health aspect, if we can get this going there may come a day when no one has a silent A-Fib anymore because everyone who turns 65 gets one of these watches and it can tell the doctors whether they’re in A-Fib or not. It’s really one of the most amazing breakthroughs in medical therapy for A-Fib that I’ve seen. We’re not there yet, but we’re close. Travis Van Slooten: Oh, yeah. Steve Ryan: Well, I really want to mention something. A lady, Pat Truesdale, said she keeps a log of everything that seems to bring on her A-Fib. And she kept this log: ice, drinks, caffeine, every meals, going to sleep at night, and she also developed symptoms that are indications of A-Fib coming: high blood pressure, belching, heartburn where she can anticipate whether she’s going to develop an A-Fib attack. And I encourage anyone who might want to read her story on our website –they might be helped by this. Now, she also has a unique story in that she’s probably the one who has had the fastest catheter ablations in history. She develops A-Fib, eight weeks later she had an ablation and was A-Fib free. I’ve never heard of something happening that fast. Travis Van Slooten: That is fast. So she’s A-Fib-free today then? Travis Van Slooten: Oh wow, that’s fantastic. Definitely I’ll link to her story because I know which one you’re talking about there so we’ll definitely link to that. Awesome. All right, well perfect. Steve I appreciate you joining me today and talking about this because it is a very, very important topic. I know when I threw this question out on Facebook it was the most responded to thing I’ve ever put on Facebook. Travis Van Slooten: Yeah, there are a lot of people that struggle with the mental and emotional challenges with A-Fib. So I’m glad we’re having this discussion, and Steve…. Steve Ryan: They won’t get much help from their doctors. That’s one of the problems. Travis Van Slooten: And even the good doctor’s like my local EP is a fantastic doctor, I absolutely love this guy, but he gives me zero information on this stuff. So even as good as he is they’re just not trained I don’t think to do that stuff. Is that the issue? Steve Ryan: Yes. That’s the issue, yeah. In other words, psychiatry, that’s another field for them. Travis Van Slooten: Fantastic. Steve, as always, thanks for joining me today. Steve Ryan: You’re welcome. Travis Van Slooten: All right, bye now. PODCAST 2: What Do You REALLY Pay to Continue Living with Atrial Fibrillation? Note: If you prefer to read instead of listening, click the transcript graphic bar below for the printed version. There are two costs of living with atrial fibrillation: financial and quality of life costs. Both are very high! ♥ A-Fib costs the United States about 6 billion each year. ♥ Medical costs for people who have A-Fib are about $8,705 higher per year than for people who do not have A-Fib. ♥ There are 750,000 hospitalizations each year because of A-Fib. ♥ Atrial fibrillation is a progressive disease that tends to get worse over time. ♥ Frequent A-Fib episodes enlarge and weaken your heart and can lead to other heart problems, including heart failure and other cardiovascular problems. ♥ Ongoing A-Fib can remodel your heart (change how your heart works), produce fibrosis (fiber-like, immobile tissue) or permanently scar your heart. ♥ You’re losing 15% to 30% of your normal pumping ability of your heart when you’re in A-Fib. ♥ Frequent or prolonged episodes of atrial fibrillation tend to stretch and dilate your left atrium. In the extreme, you lose all contracting ability and function of your left atrium. ♥ If you leave someone in A-Fib, the A-Fib attacks tend to become longer and more frequent. ♥ A-Fib is strongly linked with developing dementia (because you’re not getting enough blood to your brain and to the rest of your body). ♥ The aim should be to stop an A-Fib episode NOT just control an episode (i.e. slow the heart rate while in A-Fib). ♥ Today’s anti-arrhythmic drugs only work about 40% of the time, have bad side-effects or don’t work at all. If they do work, they often lose their effectiveness over time. ♥ Patients with persistent or long-standing persistent A-Fib: If you have been told there is no treatment besides taking drugs to manage your A-Fib, DON’T BUY IT! You have options! ♥ The Castle AF Trial reveals ablations on heart failure patients with paroxysmal or persistent atrial fibrillation resulted in a 47% reduction in death rates. In the catheter ablation group, 60% improved their ejection fraction by more than 35%! And after 5 years, 60% of the ablation group were in normal sinus rhythm compared to 22% receiving normal drug therapy. ♥ The goal for every A-Fib patient should be to end their A-Fib and not just manage or tolerate it! ♥ Editorial: Leaving the Patient in A-Fib—No! No! No! Travis Van Slooten was diagnosed with atrial fibrillation on Father’s Day in 2006. He would battle a-fib for nine years before having a successful catheter ablation in March 2015. He’s been a-fib-free since with no drugs! His blog covers his own journey and provides information, inspiration, and support for others with A-Fib. Visit his site. Travis Van Slooten: I invited Dr. Steve Ryan back again for today’s episode of the afib podcast. Steve is a former patient who was cured of his back in April 1998 via catheter ablation. He is the publisher of one of the most popular websites, A-Fib.com and he is the author of the best-selling book, Beat Your A-Fib: The Essential Guide to Finding Your Cure. So in this episode Steve and I discussed a topic that we are both extremely passionate about. And that topic being “The Real Cost of Living with Atrial Fibrillation,” and why it’s imperative to seek a cure for your afib, rather than just living with your afib. The financial and quality of life cost of living with afib are absolutely staggering. And so in this episode we discussed those costs, and again we really emphasize why it’s so important to find a cure and not just settle with a life of afib. So with that, let’s roll the tape. All right, Steve, our topic today is really near and dear to my heart – no pun intended – and I know it’s very near and dear to you as well. And I know when I’ve spoken with you in the past you and I are both very passionate about this topic, and it’s the topic of the real cost of living with atrial fibrillation. And of course, when we talked about the cost of living with afib — well, first of all, I should say when we say we’re living with afib, for most people that means they’re just tolerating it, they’re basically managing it as best as they can instead of trying to seek a cure. But the cost of doing that of just kind of tolerating your a favor rather than trying to see a cure, there are really two big cost there. There is the financial cost, but probably just as important, if not more important, is a health or quality of life cost. Dr. Steve Ryan: Absolutely, yes. Travis Van Slooten: Yeah, absolutely. So let’s talk about the financial costs, Steve. You found some interesting stats on the CDC website. Can you talk about these financial costs? Travis Van Slooten: Yeah, and unfortunately with the health care plans that are out there today a lot of people that won’t even meet their deductibles, so that usually probably out-of-pocket cost. Yeah, that’s on fortunate. Dr. Steve Ryan: Yeah, it’s medication, it’s doctor visits, it’s ambulance, it’s trips to the ER it’s you know, all kinds of stuff goes into that that run up the bills cost. The CDC says there are 750,000 hospitalizations each year because of afib, and afib contributes to an estimated 130,000 deaths each year. The death rate from afib has a primary or a contributing cause of death as been rising for more than two decades. Now that’s because the more and more people are getting afib because it’s a condition of aging, but those are really staggering figures. Travis Van Slooten: Yeah, tell me about it. And I can attest to those because until I seek my cure which was an ablation, those figures are actually pretty accurate. I mean I remember specifically one year I spent easily $8,000. My trip to the ER was $4,000 alone. Because it was my first episode and I was in an ambulance so the ambulance ride alone was like $1,500. I mean it was crazy, but the financial costs are unbelievable. Dr. Steve Ryan: Same here. Travis Van Slooten: You know it’s just like… So, Steve let’s talk about this. What are the health and quality of life issues that go into “living with afib“? Dr. Steve Ryan: Well, it seems you and Travis, we both have had afib and we know how wonderful it feels to go from afib to normal sinus rhythm, and to feel wonderful, your body is alive again, you can do everything that you used to do. And leaving people in afib just makes no sense. Let’s say, I mean afib is a disease, it’s a progressive disease that tends to get worse over time and wreck your life and wreck your heart. Let’s say someone had, God forbid, pancreatic cancer and the doctor told them, “Well, we’re just going to leave you in pancreatic cancer. We’re going to give you a few meds just to keep the pain away.” You look at that doctor and say, “You’re out of your mind.” Why leave someone’s heart in a disease state where you know they’re going to get worse and maybe eventually die from it? It makes no sense at all to me. Travis Van Slooten: And I think part of the reason for this is with afib, you know, for some people when they have their episodes they don’t feel that bad, especially with people with silent or asymptomatic afib where they don’t really feel the episodes. But even if they have bad episodes, you know, for a lot of people they have an 8-hour, 10-hour episode that goes away and they’re good for another month, but I think what happens is they fail to realize the long-term picture here of what happens to your heart if it’s left in afib. So let’s talk about that. I think that’s the crux of the issue here is that people think “We’ll hey, it’s not that bad now,” but what they don’t realize is if you keep your heart in that states, as you talked about, down the road the end game is it could ultimately lead to heart failure. That’s the issue, right? Dr. Steve Ryan: Yes, and many other things. Leaving people in afib is a death sentence. There’s all kinds of that document that. Here’s what afib does to you. Let’s say you give them the example of someone who has maybe a 10-hour episode once or twice a month. Having episodes like that enlarges and weakens your heart, and it leads to other heart problems and heart failure and cardiovascular problems. Afib, because it is a progressive disease it remodels your heart. I mean when we talk remodeling we’re saying your heart is changing permanently because of afib. Now afib produces what is called fibrosis. Now fibrosis is if you look inside a heart you’d say smooth — in a normal heart you’d seem normal smooth heart tissue. It looks very healthy and red and everything is proper. When the heart becomes fibrotic, that smooth heart tissue turns into fibrous tissue. It turns it to basically dead tissue. There’s no transport function, there is no nerve going through, there’s no contraction. It’s dead. It’s like having dead tissue in your heart. And that’s what afib produces. And unfortunately, even though many of the remodeling effects of afib can be corrected by a catheter ablation, fibrosis is usually irreversible. Now the other thing that afib does because when your heart is functioning normally, the atria, the upper part of your heart squeezes down, squeezes blood down into your ventricles and the ventricles and sends the blood to the lungs. In afib instead of that squeezing down, that pumping down blood…if you look in your heart your heart is fibrillating, it’s vibrating it’s quivering, it’s not pumping properly. I mean, you’re losing 15 to 30% of your normal pumping ability of your heart. And this action tends to stretch and dilate your left atrium. If it goes too far you lose contractual ability of your left atrium to function at all. And obviously if you leave someone in afib, the afib attacks tend to become longer and more frequent. There’s been a study where they followed people who developed afib for a year and they were just on rate control meds to control the heart from beating too fast, but leave them in afib, almost half within a year went into a chronic all-the-time afib (long standing persistent atrial fibrillation). Yeah, so the odds are really — I guess a lot of people don’t…I mean, how many people stay in paroxysmal occasional afib for years but the odds are against them. Travis Van Slooten: I was one of those. I went 8 years, and then it was the 8th year where it spiraled out of control and became a weekly thing, and at that point I put the brakes on that and I had my ablation. Dr. Steve Ryan: Yeah, good for you. And some of the other things that afib does is because you’re not getting enough blood to your brain to the rest of your body, people tend to develop dementia. I’ve heard people describe being in afib like they’re in a brain fog. You know, they go to work and they can function. Things they used to do, no problem, all of a sudden they can’t even remember what they’re doing or how to do it. Or they used to speak a foreign language now they can’t anymore because they’re in afib. One doctor gave at a conference gave an amazing example. His patient would be talking to him normally like a normal patient, he would go into afib and he could no longer talk. That’s the kind of thing that happens with afib. It just has really bad effects over time, and to leave people in afib like that is a death sentence – all too often. Travis Van Slooten: And so what do you tell the person that again, they go to the doctor they have paroxysmal afib, which is just occasional episodes here and there that end on their own. They go to their doctor, they’re newly diagnosed — let’s say they’re, I don’t know, let’s say they’re 50 years old they’ve had one episode and so they go in the diagnosed “Yep, yep paroxysmal afib,” and the doctor typically in this scenario is going to say, “You’re fine for now. Here’s are some beta blockers,” or maybe “here’s a pill-in-the-pocket or whatever.” So that person will come to me or probably to you too Steve and I’m sure they’ll say, ‘Do I really need to be thinking about an ablation already at this point?” I mean, how do you handle that? What do you typically advise them to do? Dr. Steve Ryan: Well the example you gave — in other words, if they’re taking flecainide as a pill-in-the-pocket they’re doing something, they’re trying to stop the afib, and they’re trying to stay in sinus with them. That’s good. I mean it may not be the best strategy but it may be something that will work for them for a while. But just the bad thing is to let people stay in afib and just give them a rate control beta blocker to keep their heart from beating too fast. That is what will kill somebody. But if they’re taking chemicals for drugs that will stop their afib, or if they have an attack will stop that attack, that’s good; it’s not the ideal but certainly they’re doing something to keep themselves out of afib, and that’s a good thing. Travis Van Slooten: So the message here – and this is where I wanted to get to and I’m glad that we’re going there – is the message we’re sending here is — because I know it’s semantics, but if you were diagnosed with afib you have afib but then there are the actual episodes. To my mind they are two different things like I have afib but I’m not always in afib, I don’t always have episodes, at least for some people. So for the person that, okay, they’ve been diagnosed with afib but they’re not, they don’t have episodes all the time, in other words, they’re paroxysmal, the course of action may be fine to just stick with the drugs, but the key should be you’re taking those drugs, as you mention Steve, to get out of afib but not just stay in afib and make it tolerable. Dr. Steve Ryan: Right, and of course we must say that anti-arrhythmic drugs are very imperfect, there’s no magic pill that anyone can take that will cure them of atrial fibrillation so they never have to worry about it again. The problem with today’s anti-arrhythmic drugs is that they don’t work or if they do work for a time they lose their effectiveness eventually, or they have bad side effects that they get impossible to take them. And they’ve done a number of studies where they have compared catheter ablation to taking anti-rhythmic drugs, and catheter ablation is much more healthy. It’s, you know, all the bad things that can come from staying like a lifetime on anti rhythmic drugs versus a catheter ablation where you’re cured of afib and you don’t have to worry about it anymore, there’s no comparison. Travis Van Slooten: Yeah, absolutely. And then certainly for someone then that has persistent afib which means your episode is a week or longer or you have long-standing persistent afib, certainly those people should not accept the diagnosis that they should just live with their afib and here’s some drugs to make it more tolerable. Those are the people we especially are saying look, there is a cure or a potential cure out there for you and it’s probably going to be an ablation or a surgical procedure, but by all means you do not have to live with afib. Dr. Steve Ryan: Right. Now in the example you gave we should tell patients that someone who has been in persistent afib for a while is not going to be as easy as someone who just developed afib. They may have to go to a master EP and they have to go through two ablations; one to get the main spot and second for a touch-up ablation, but it’s still a lot better than living with afib. And they should realize that if you have persistent afib you do not have to live in a fib. There is a cure out there. 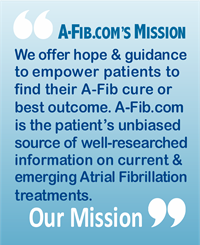 It may not be the easiest thing to do, or you may have to research and find the best EP doctor you can find, but there is light at the end of the afib tunnel. You don’t have to live for the rest of your life in afib. Travis Van Slooten: And I think that’s such an important message because I get so many emails from people that are in persistent afib and they tell me you know my doctor says I’m not a candidate for an ablation because I’ve been in persistent afib for 2 years and they don’t want to touch me so they just keep me on drugs. Is that true? I mean that’s kind of the gist of a lot of the emails that I get, and I always tell them that’s absolutely not true. There is hope for you. Dr. Steve Ryan: Yeah, and I can understand many of — first of all, not all electrophysiologists (EPs) are equal. Some are better than others, some are more experienced, some do not want to fool around with anyone who has been…in fact they will say in their statement on their websites, “We don’t take anyone who has been in persistent afib for over a year.” Why? Because it’s too difficult. But that’s not the case for some of the better people like you had your ablation by Dr. Natale, Andrea Natale, right? Dr. Steve Ryan: I mean people like him take those cases all the time. Travis Van Slooten: Yeah, I mean 75% of his caseload is just that. But like you said, your path to a cure may not be necessarily easy but certainly do not give up and say, “Well this is my life and I just got to tolerate this for as long as I can with the drugs until my time is up.” That’s not the case. Good stuff. Dr. Steve Ryan: I’ve got one other thing. At the last AF Symposium in January there was a presentation by a Dr. Marrouche that was perhaps the most important presentation in the last 10 or 20 years for patients. I mean it’s a groundbreaking study, and it relates to what we were talking about. It’s called The Castle AF Clinical Trial. Now what they did was they took patients who had real bad heart problems, we’re talking ejection fraction of below 35%. These are people who probably without help would die within the next year. These are patients who had really sick hearts and they had ICDs or some kind of a monitoring device inside their heart that could tell the doctors whether they were in afib or not and what was going on in their heart. Dr. Marrouche started off by saying, he gave the example of a 50 year old patient of his who had an ejection fraction of 24%, I mean that’s really low. That guy is near death. So he had an ablation and he, by the way had moved from paroxysmal afib to persistent. He had taken anti-arrhythmic drugs that didn’t work; sotalol and Amiodarone, which Amiodarone is a killer. Travis Van Slooten: Very toxic. Dr. Steve Ryan: He had failed electrocardioversions. So he gave him an ablation and cured his afib and right away his ejection fraction improved from 24% to 44%. Dr. Steve Ryan: Now, what that means in practice is that this guy’s life was saved. He was no longer in danger of dying from congestive heart failure. And so he went on and described The Castle AF study with a bunch of patients like this and they found that after catheter ablation there was a 47% reduction in death rates. Now you’re saying, 47%, is that good? That’s fantastic! These patients were near death, and a 47% reduction in death rate for patients who had failing hearts, that’s incredible. In the catheter ablation group, 60% improved their ejection fraction by more than 35%. That is amazing. Travis Van Slooten: That’s amazing. Dr. Steve Ryan: That means that these patients who had a catheter ablation basically had their lives saved. They went from a heart that wasn’t functioning to a heart that was beating normally again. And after 5 years, 60% of the ablation group were in normal sinus rhythm compared to 22% receiving normal drug therapy. And that was you know, it could be rate control, it could be amiodarone, whatever people wanted to do. And there is a 38% reduction all across mortality. Heart failure emissions were radically improved. They didn’t go to the hospital anymore because they were cured, and obviously the quality of life was just amazingly better. Here we have you and I both know how wonderful it feels to go from afib to sinus rhythm, but there were no studies up to this point that said it makes any difference. In other words, so what? So you’re in sinus rhythm, you still have the same mortality according to the AFFIRM study which is an old study that nobody follows anymore. But now we have hard data that proves catheter ablation not only removes your symptoms, makes you afib free but lets you live longer. You live a better life and you live a longer life and the more healthy life. Now Dr. Douglas Parker from the Mayo Clinic added in the Q&A he said, I mean this is a little hyperbole, he’s exaggerating but he gets the point. “People everywhere were screaming with delight when they saw the results of your paper!” He’s right. When you were there at that meeting it was like you were watching history unfold in a way. I mean historical finding that now everybody with afib knows that a catheter ablation will not only cure you and make you feel better but will let you live longer and more healthy life. That’s really important, probably the most important to study to come out for patients in the last 10 years. Travis Van Slooten: Yeah, and that’s a published study so we can link to that and I can dig that up? Dr. Steve Ryan: Yes, that’s a published study in January. Travis Van Slooten: Perfect. And I think it’s important to, that study like you said these were people that were near death, so if they experienced that great transformation, imagine the guy that’s pretty much healthy and has paroxysmal afib, I mean the benefits for him are going to be… I mean, it’s amazing. Again, that’s why Steve and I are so passionate about this topic. There is no excuse to stay in afib. Dr. Steve Ryan: Can you imagine, let’s say you’re someone with congestive heart failure; it feels like you’re suffocating, it feels like you’re going to die any minute. And 90% of people in this condition die within a year. And all of a sudden you have a catheter ablation and your heart is normal again, you’re having a normal ejection fraction. All of a sudden you’re out walking around, you’re talking to friends, you feel great. I mean you don’t feel perfect because it’s not…but your life you have your life back. Can you imagine what that means for these patients? It’s wonderful. Travis Van Slooten: Yeah, and their families and friends. It’s just amazing. Thanks for sharing that study. Definitely I’ll be sure to link to that in the show notes so people can look at that. Awesome. Anything else that we need to discuss on this? Travis Van Slooten: So the message here Steve is clear. The goal for every afib patient should be to end their afib and not just manage it or tolerate it, correct? Dr. Steve Ryan: Exactly. And we’re talking rate control where they just leave you in afib and don’t try to get you out of afib. Travis Van Slooten: Yes, awesome. Well Steve it’s been a real pleasure talking to you and I just want to thank you for your time. Dr. Steve Ryan: My pleasure. Travis Van Slooten: And Steve you can be found at A-Fib.com, correct? Travis Van Slooten: Awesome. 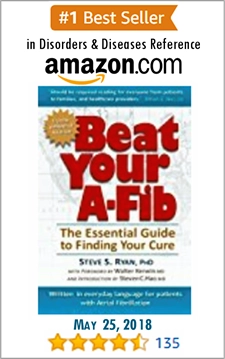 And just a quick plug too, Steve’s got a great book, Beat Your A-Fib, available on his website and on Amazon as well. And Steve, are you going to be rolling out an updated version of that book, because I remember at one point you had mentioned you were going to work on an update. What’s the status of that? Dr. Steve Ryan: Well, we’re working on the second edition but it hasn’t been coming along very well. We’ll keep trying. There’s just been a lot of changes in the last 4 years that needed to be addressed. The book right now is very factual and timely and helpful, but it’s just, there’s a lot of new developments like this Castle AF study. Those are the things that need to be added to the book. Travis Van Slooten: Yeah, and the beauty of the book is as the title implies, “Beat Your A-Fib,” not live with your Afib so that’s why I wanted to put a plug in there for that book. Steve again, thanks for your time and we’ll talk to you soon. Thanks Steve. Dr. Steve Ryan: You’re welcome. Outro: Thanks for listening to the podcast. 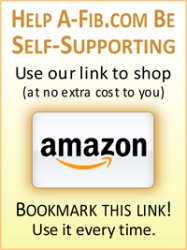 Be sure to visit livingwithatrialfibrillation.com for more information, inspiration and support. Be well, and please join us next time.